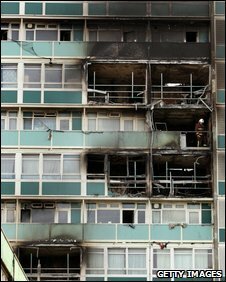 Councillors are to call for a public inquiry into the fire in a south London tower block that killed six people. Labour councillor Ian Wingfield said before a Southwark Council meeting he wanted a "full and independent public inquiry" into the Lakanal House fire. Three women and three children, one of them only weeks old, died in the fire at Sceaux Gardens Estate in Camberwell. The police have urged local people to submit pictures or footage taken during the fire to assist with the probe. The building, which now has scaffolding around it to stabilise the structure, remains out of bounds for its nearly 150 residents who have been provided temporary accommodation. The Metropolitan Police said officers would interview all residents to help them ascertain the cause of the fire. Acting Det Ch Insp Rick Murphy said: "We need to ensure that necessary investigative work has been exhausted before it can be handed over to Southwark Council. "We also wish to ensure we obtain any photographs or moving footage material that might help in our inquiries as to how the fire started, as soon as possible." At the council meeting held on Wednesday evening Southwark council leader Nick Stanton gave an update of the actions the council was taking following the fire. He said the council was looking after 75 families in emergency accommodation and was finalising temporary accommodation for all 98 families affected. "Residents are currently living in addresses mainly across south-east London, but we're working hard to bring them all back to Southwark," he said. He said there was no indication yet as to when people may be able to return to their homes. He also said from Thursday, a non-repayable grant would be offered to every family that had to move out of the block with the amount received dependent on individual circumstances. He said the emergency assistance centre for residents needing help will move from its current address in Vestrey Road to Cator Street, to allow for more private space and a creche. "We need to understand quickly how this fire started and spread in the way it did and that is why we continue to co-operate fully in the police and fire investigation," he said. The council meeting comes as London mayor Boris Johnson launches his draft London Housing Design Guide which stipulates the design requirements the mayor will expect for all new publicly funded homes. Previously he said the design of the block, which has only one central staircase, would be investigated to see how Friday afternoon's fire, which started on the ninth floor, spread so quickly, resulting in fatalities.